Concerto for Flute, Harp and Orchestra in C Major, K. 299 (297c) (for Flute, Harp & Piano Reduction). Composed by Wolfgang Amadeus Mozart (1756-1791). Edited by Jan Philip Schulze, Robert D. Levin, and Andras Adorjan. For Flute, Harp, Piano. Flute. Henle Music Folios. Pages: Score: II and 41 * Fl Part = 13 * Harp Part = 35. Solo parts and piano reduction. 106 pages. G. Henle #HN768. 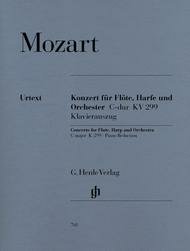 Published by G. Henle (HL.51480768).Edited by András Adorján. Piano reduction by Jan Philip Schulze. Cadenzas by Robert D. Levin.